Even if you have given up on LA, cursed its tackiness, screamed at its traffic, revolted from its inanities, choked on its air and dreamed of exile from its toxicities, you might be seduced on Sunday afternoon, as I was yesterday, by a place hidden away that seems like a small town in the Poconos. I accompanied a friend on an errand. She manages properties, and was cleaning up after renters at a small house on a street called Lake Shore Avenue. 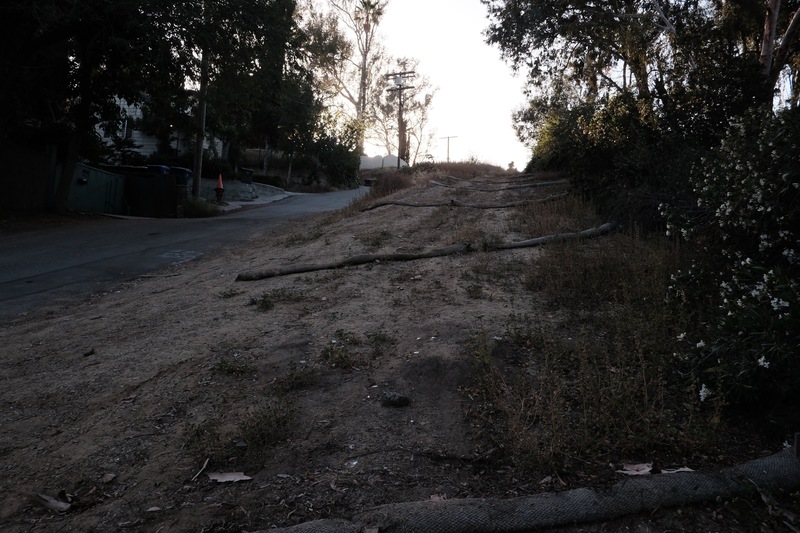 East of Glendale Blvd, south of the 2, west of Elysian Park, it sits snuggly into a hill that blocks the setting sun. 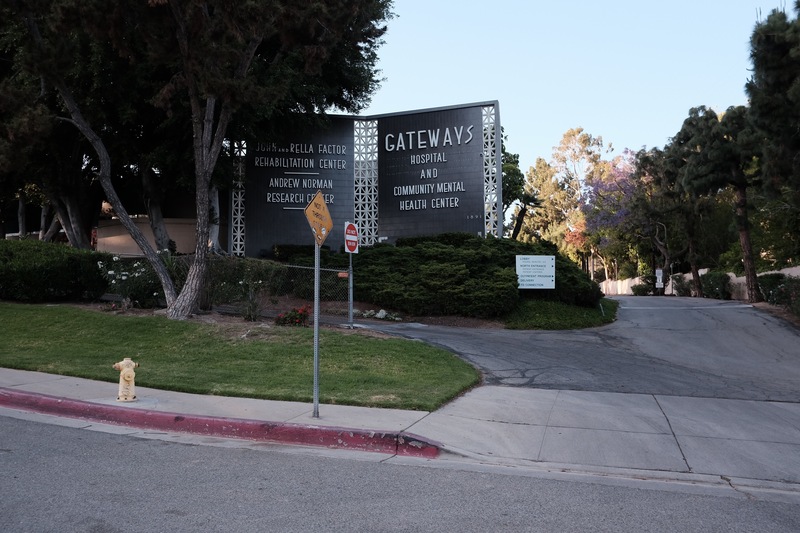 Shady, built with little bungalows, it bisects, at Effie, an institution: Gateways Hospital and Community Mental Health Center. A mid-century sign sits at the entrance to the facility. We parked on Effie and looked ahead at a wide dirt path climbing up a steep hill where nets were laid down to trap water and debris that may pour down here fiercely. My friend went to work on her property, and I climbed up the trail. 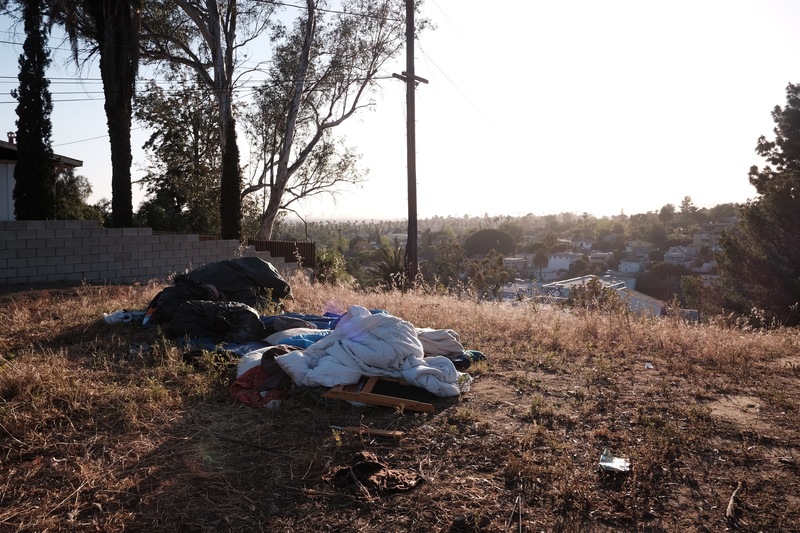 Around me were dried, parched grasses, the remnants of homeless blankets and bags of clothes, and, at the top of the hill, a stucco shack of a house, with a pitted asphalt driveway, and a wooden deck. It was guarded by ziggurat cinder block walls and reinforced steel window bars. The dilapidated home was a find, unusual in its state of disrepair. For we live in a city of brutally competitive property investment, where every top elevation has been captured by someone richer. This mountain hideaway lacked the hidden cameras, the expensive cars, the pool, and the pretense to architecture. An eccentric hermit might inhabit it. Moby if he had no money might live here. Its views stretched out to Silverlake, downtown, and tall radio towers across the way. Yet it was an uneasy isolation. It felt dangerous, not reassuring. Bucolic and rustic in Los Angeles never exists in purity. Helicopters and sirens in the distance, the threat of fire, the presence of people without homes, the surprise of events that might end our life erupting from the deepest earth, or from a violent intrusion through an open window. These are the sights, sounds and conjurations of the imagination haunting happy moments. That is how that house and hill felt. Back down on Lake Shore Avenue I walked past institutional houses, illuminated by industrial floodlights, set along the street, behind gates. Two older men were on the stoop of one place, smoking. They nodded to me and I waved back. 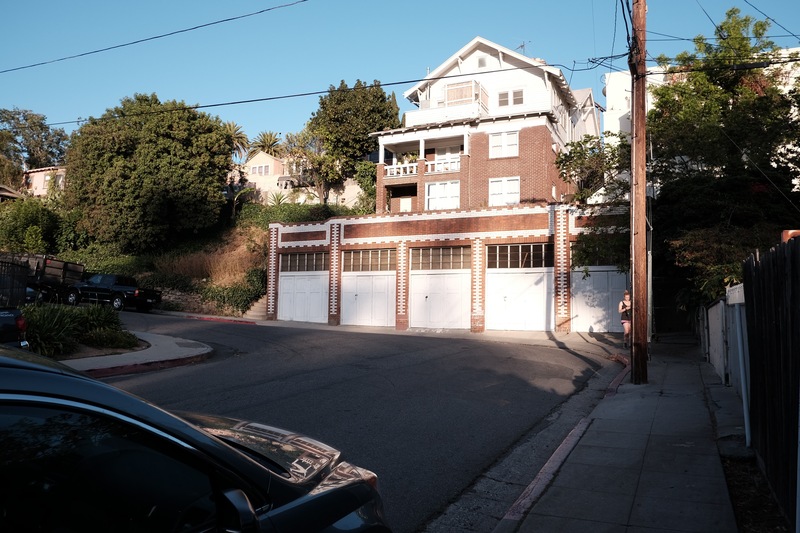 Outside the property of Gateways, dominating the bright part of the hill on Lake Shore Avenue, was a tall, two-toned, red and white brick house looming over a row of old garages. Homely, graceless, squinting in the sun, it refuted the lovely myth that everything historic is charming. The white “sanitary” bricks, glossy and washable, were often used in the 1920s on building facades for bakeries and cleaners. A small signifier of community well-being, a landscaped traffic circle, ended my walk up Lake Shore. That idea that a street could come together in a circle, unified by architecture, common purpose, cafes and conversation, there was something of that here, but I saw no other pedestrians. The only movement was daylight in retreat, shadows moving over the street. After walking around, I came back to my friend’s property and went inside. We stacked dishes in the dishwasher, carried out bags of food from the refrigerator, and a basket of dirty towels. She turned on the alarm and locked the door. We got in the car and left to return to the real city beyond. I don’t know about the rest of you readers out there, but I’m beginning to fear the day that Andy stumbles across my aging chicken coup that dates back to earliest Sherman Oaks development. 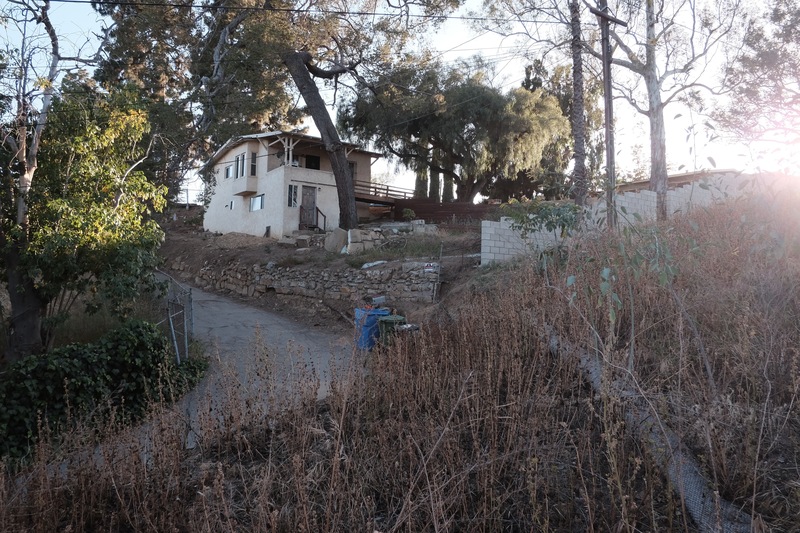 It has seen a plethora of indigenous walnut trees come and go, a horse ranch, markets, a Post Office and an entire block of businesses turn to even more housing development. To say that immigrants have built America would be to mirror the image of present day ownership along my block/my corridor/the entire precinct. Thanks to Tweeters/Facebookers/and the like, this area even has a moniker/a nickname for the residents to hide beneath as they complain about one another and whomever’s dogs pee or poop the most on their neighbors’ green lawns (remember the water shortage? What shortage? )…who has the most illegal rentals tucked in to their backyards/garages/patios…and-of course-the usual sounds of sirens filling out the sense that we are not alone as a nightly assault on the local gas station and/or market attracts our city’s finest as they are expected to clean up the riff-raft of garbage that just naturally gravitates in a loop towards any location they think has money to share! Thank you Robert. Please send me an invite and I will gladly come to your place! ← Van Nuys Savings and Loan.